St. Hubert’s Church in Itzig was built in 1750 and extended to its current state from 1893-95. It accommodates numerous works of art, including wooden sculptures from the 17th and 18th centuries, baroque frescoes, stylishly stained glass, an handsome collection of sacristy-owned sacral items, and the monumental high altar of the governor of the duchy of Luxembourg of the time, Johann Baron von Beck (1588-1648), which stood as a side altar in the Order of St. Francis’ ‘Knuedlerchurch’ in Luxembourg-City up until the French Revolution. Despite the parish’s extreme age, its first organ was ordered from the manufacture d´orgues luxembourgeoise G. Haupt in Lintgen as late as 1954. 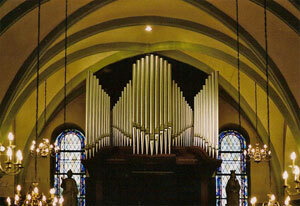 The stoplist was proposed by the former cathedral organist Albert Leblanc. The instrument was inaugurated on June 26th, 1955. 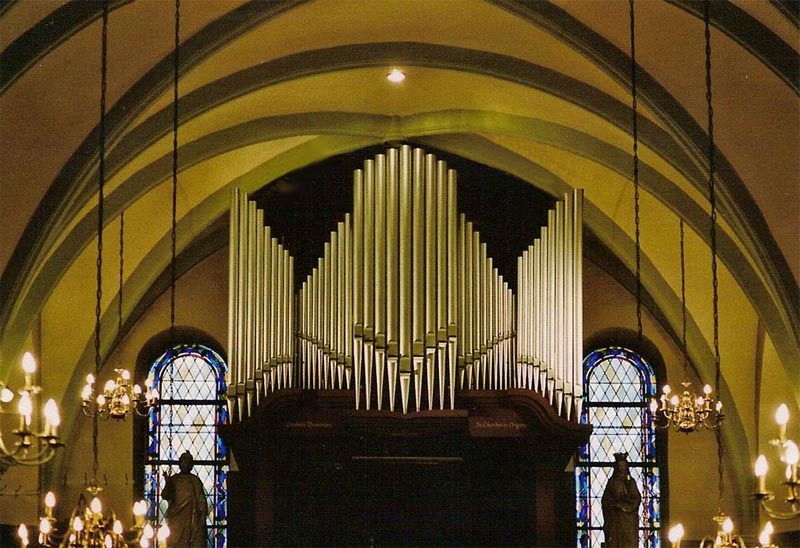 After 40 years of service, St. Hubert’s interior renovation of 1996 opened up the opportunity to clean the instrument in its entirety, replace the Terzzimbel and Rohrschalmei voices with Sesquialter and trumpet voices, and replace all puffers made of skiver split skins and the blower.